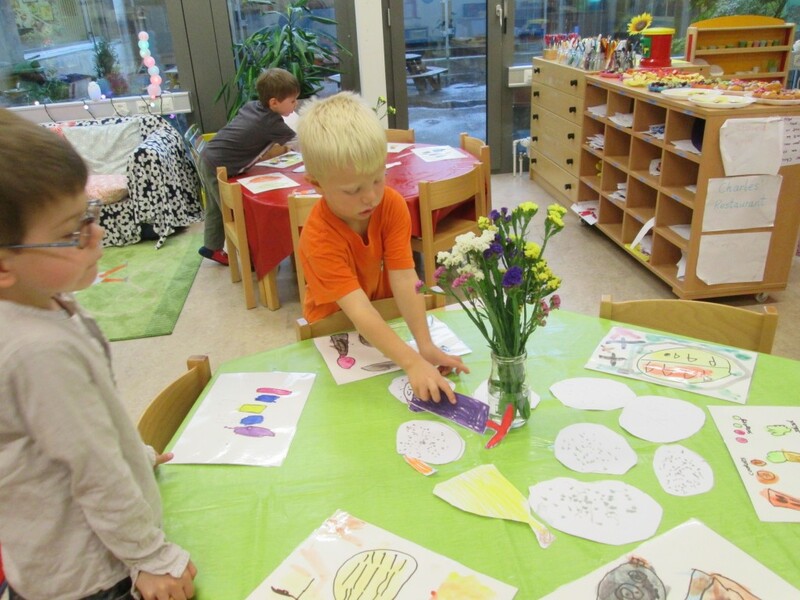 Christopher drew a picture of a sunflower to decorate a dining table. Wille made a drinks menu and said that we needed lots of pictures of food to show what was in the restaurant. Jeremy thought we should hang up balloons and have policemen standing at the doors in case there were any naughty people. Pippa wanted to make golden stars as decorations, which would hang down on string. Lily thought that this sounded like a good idea and said she would add paper hearts onto the string, while Nicky thought that red paper circles should also be added. 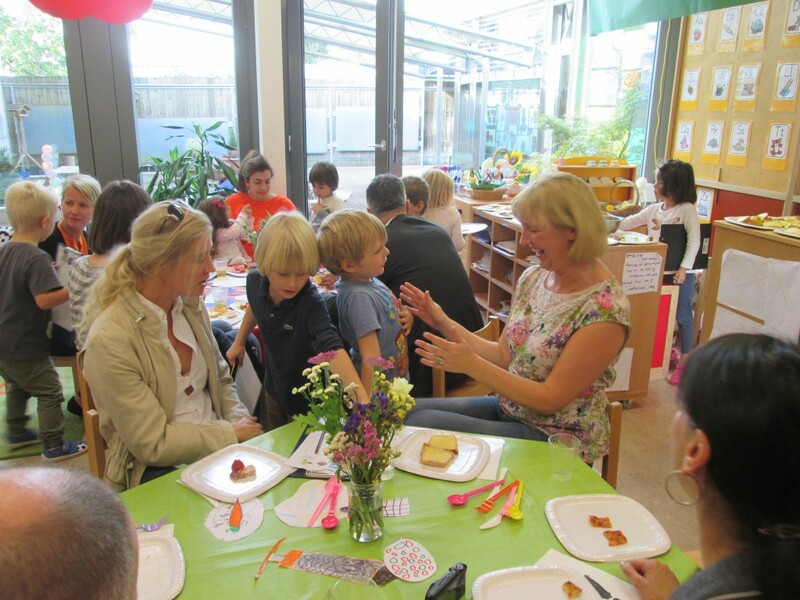 Thomas said that it was important to have a book area for the young children while they wait for the older children to finish eating. Before we set to work on our planned tasks, we talked about who we should invite to our restaurant. 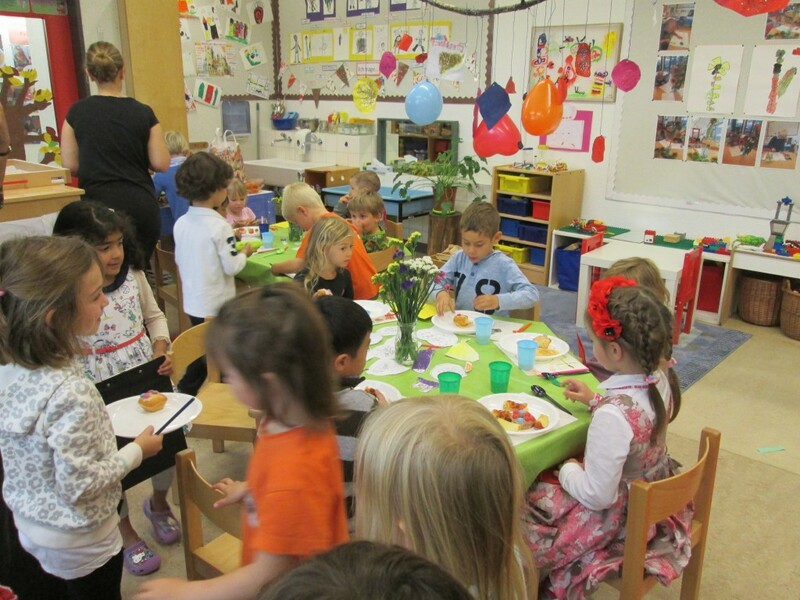 It was decided to send invitations to our friends in EY2RR first of all and then we would invite our families for the second opening of the restaurant. We wrote our invitations and personally delivered the them to our friends, who seemed really excited about coming to our restaurant. We spent the next few days hanging up the decorations we had made and completing our preparation work. 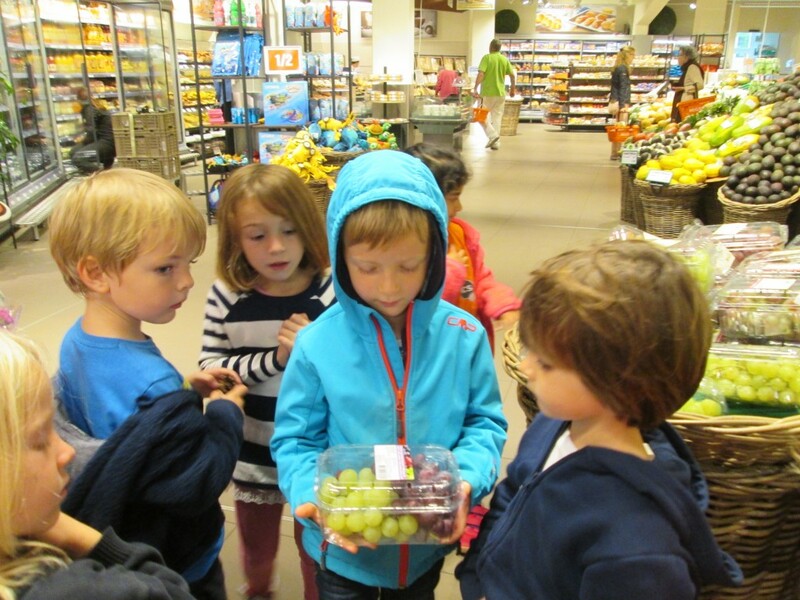 Then we visited the local supermarket to buy the food, plates, cups and cutlery. We were very lucky, as Pippa had taken action and brought in many of these items from her home for us. Our visit to the supermarket was a success and we bought every item on our shopping list. 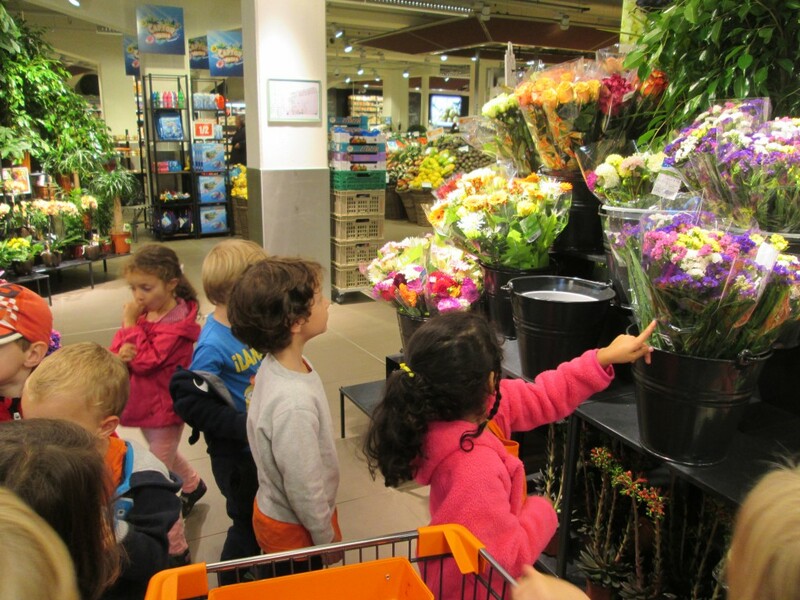 Choosing flowers to decorate our dining tables. Selecting fruit to serve at the restaurant. The day of the restaurant opening finally arrived and we were all so excited. Thomas began the morning with a surprise for us all; he had spent the previous evening making a colourful and extremely long paper chain to hang up as an additional decorative feature. He had also made some blue paper shapes to hang on string. We were all grateful to Thomas and pleased that he took the initiative and the time to do this for us all. Now it was time to prepare the food before the restaurant opened at 9:45. Once that was done, we trimmed and arranged our cut flowers for each dining table. Our last job was to set the tables beautifully. We ensured each place setting had a hand-made placemat, which was decorated with drawings of different foods and drinks, and we also laid the crockery and cutlery neatly on the table. 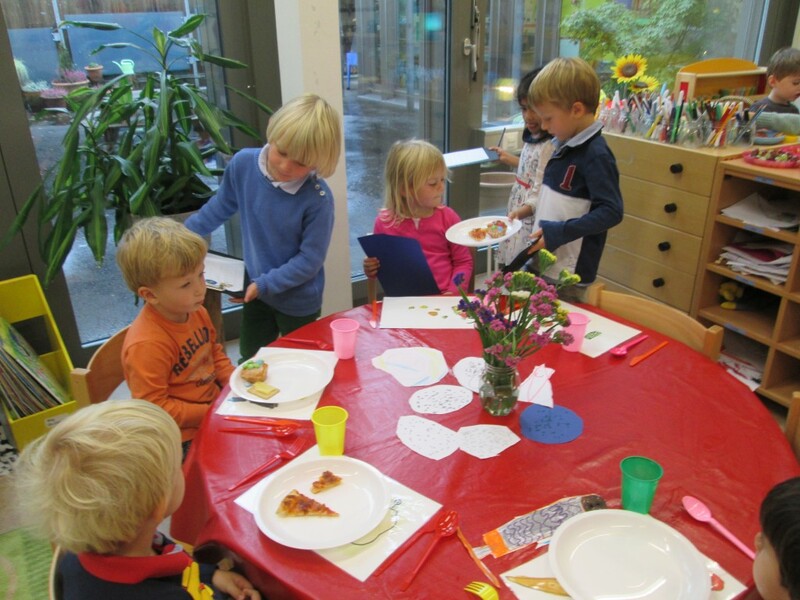 Then we placed cut-out drawings of different foods as a final adornment to each dining table. 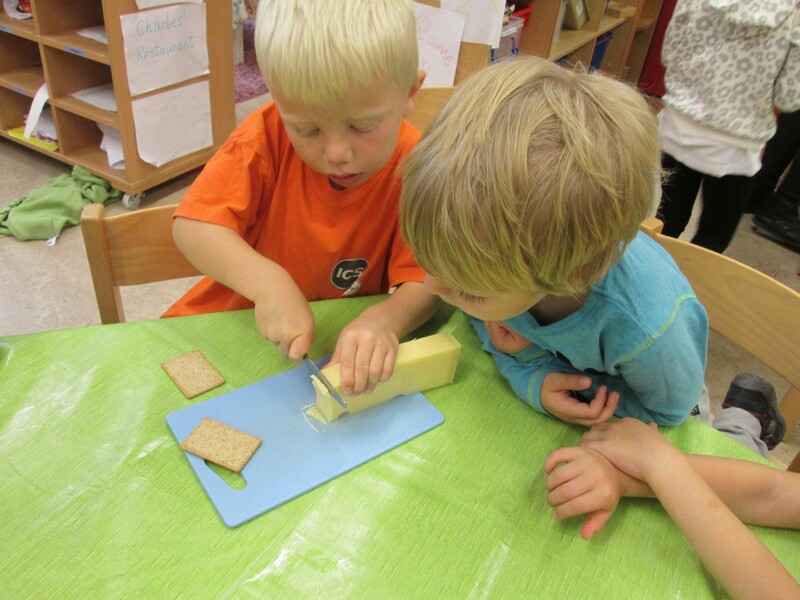 Preparing the cheese and crackers. The waiters were ready with their clipboards and note pads and the chefs were ready in the kitchen. We just had to wait for our guests to arrive. At 9:45 our friends arrived at the restaurant. We handed them menus to peruse before seating them at their tables. Once they were seated, the waiters came to take their orders and the restaurant suddenly became very busy. The waiters were giving the orders to the chefs, who quickly prepared the plates and handed them to the waiters for service. The diners seemed very satisfied with their meals and continued to order quite a lot of food. Once everyone was full and satiated, it was time for our guests to pay for their meals. Thankfully our friends had brought (hand-made paper) money with them to pay with at the cash register. Taking food orders and serving the meals. Once our customers had left and we had cleared the tables, we took a moment to reflect on the huge success of our restaurant. We agreed that we had collaborated and worked together extremely well with the planning and the final implementation of our restaurant. There was much passion and fascination throughout this inquiry, and the children clearly enjoyed learning more about the workings of a restaurant. In our everyday lives we delight in being the diners in restaurants and it was interesting to compare the differences in roles between organising and working in a restaurant and enjoying the leisure time of a diner. Examining these different roles led to some interesting questions related to why we have restaurants. Our restaurant success was repeated a week later when our families came to visit. This inquiry ties in perfectly with our current unit, Who We Are, which has a focus on how our senses help us to learn. The restaurant is open to our families. 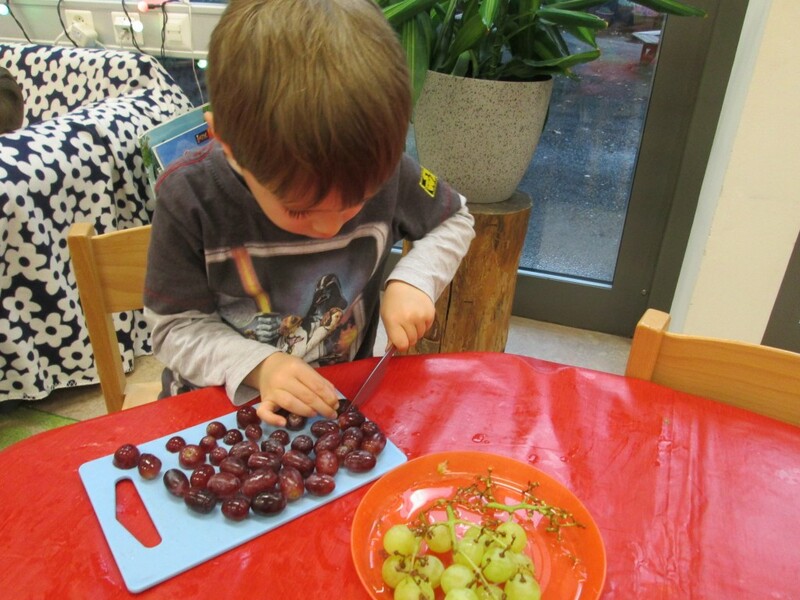 As an Early Years teacher, I am extremely passionate about working with young children. Their curiosity about almost everything is truly infectious and I enjoy sharing in their learning, discoveries and sense of wonder about our world.